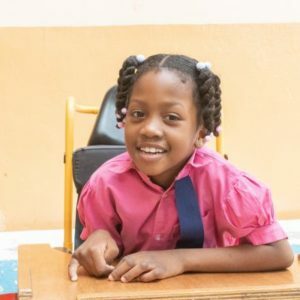 Anyelina is a student in the special needs ministry. Her needs are not mental/cognitive but physical. She is unable to walk but she is trying. She now has a walker and is constantly wanting to use it to try and get around. She is very smart always remembering everything from lessons to names and events. Anyelina enjoys reading and playing with dolls. She lives with her father, mother, and 5 siblings. They use their neighbor’s bathroom and they receive water every 5 days when the electricity comes.